Good Morning, this is Capital Essence’s Market Outlook (the technical analysis of financial markets) for Tuesday September 18, 2018. We’ve noted in the previous Market Outlook that:” the fact that the S&P is short-term overbought as it tests key sentiment level suggested that upside gains could be limited. As for strategy, we’d look to trim positions into short-term overbought strength.” As anticipated, S&P closed lower on Monday, down 0.6 percent to 2,888.80, after Donald Trump said an announcement on U.S.-China trade after market close. The Dow Jones Industrial Average fell 0.35 percent to 26,062.12. Nasdaq Composite dropped 1.4 percent to close at 7,895.79. The CBOE Volatility Index (VIX), widely considered the best gauge of fear in the market fell more than 2 percent to close at 12.07. Chipmakers contributed to the drop in the major indexes Monday. The group was under selling pressure as fears they may get hit with tariffs. After surging more than 36 percent in 2017, the VanEck Vectors Semiconductor ETF (SMH) fell 1.35 percent Monday to 105.24, bringing its YTD gains down to just over 7 percent while the S&P gained 8 percent over the same period. Now the question is whether recent pullback is a pause that refreshes or it’s a beginning of a something worse? Below is an update look at a trade in SMH. Our “U.S. Market Trading Map” painted SMH bars in red (sell) – see area ‘A’ in the chart. The first dominant feature on the chart is the rising trend line starting in late 2015. The second dominant feature of the chart is the triangle pattern since early 2018. Over the past few weeks, the ETF has been trending lower in a short-term corrective mode after the late August rally ran out of steam near the 2018 falling trend line. Over the next few weeks, traders should monitor trading behaviors at the blue line, near 104. That level has been tested several times over the past months. A close below it on a weekly basis could trigger a new down leg with downside target around 92, based on the 2-year moving average. SMH has resistance near 110. Short-term traders could use that level as the logical level to measure risk against. Short-term technical outlook shifted to slightly bearish. Last changed September 17, 2018 from bullish (see area ‘A’ in the chart). Once again, S&P fell below the important sentiment 2900 mark after last week’s oversold bounce ran into resistance just below the all-time high set in late August. Momentum indicator shifted lower from overbought zone, suggesting further short-term weakness likely. The lower boundary of the pink band, around 2885, represents key support. It was tested several times over the past months. This history indicated an important role in terms of support. A close below that level signify a bearish reversal and a test of the trend channel moving average, around 2846, should be expected. Short-term trading range: 2846 to 2922. S&P has support near 2885. A close below that level will trigger a short-term sell signal with downside target near 2846, based on the trend channel moving average. The index has resistance between 2900-2922, or the lower boundary of the red band. In summary, market internals deteriorated as S&P’s testing key technical level. S&P will have a downward bias this week, pressured by short-term negative momentum but we expect support at the trend channel moving average to remain largely intact. Good Morning, this is Capital Essence’s Market Outlook (the technical analysis of financial markets) for Monday September 17, 2018. 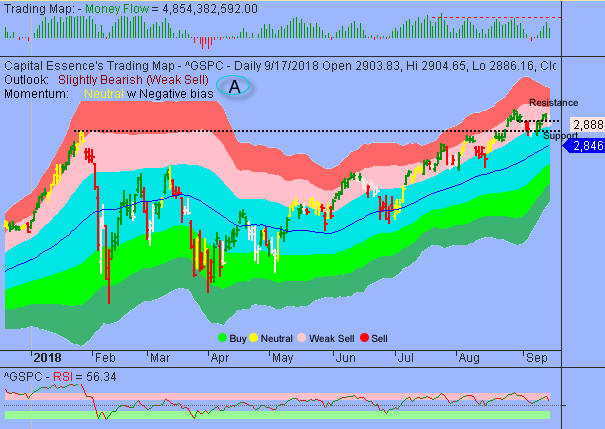 We’ve noted in the previous Market Outlook that: ”S&P broke key resistance Thursday, signified the one-week sideways trading pattern had resolved itself into a new upswing. 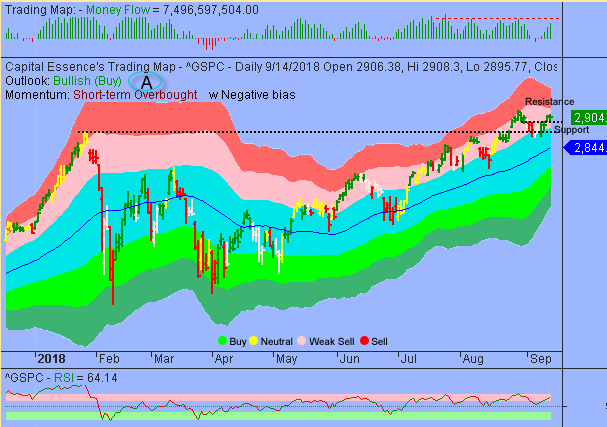 Nevertheless, overbought conditions on an intraday basis will put a cap on the upside.” As anticipated, S&P posted a marginal gain on Friday, up 0.03 percent to close at 2,904.98. The Dow Jones Industrial Average also added just 0.03 percent to close at 26,154.67 while the Nasdaq Composite slipped 0.1 percent to 8,010.04. The CBOE Volatility Index (VIX), widely considered the best gauge of fear in the market fell more than 2 percent to close at 12.07. The financial sector was under selling pressure last week as banks stocks were weighed down by a flattening yield curve. After surging 20 percent in 2017, the Financial Select Sector SPDR ETF (XLF) fell 0.4 percent last week to 28.23, up just over 1 percent YTD while the S&P gained over 8 percent over the same period. Now the question is whether recent pullback is a pause that refreshes or it’s a beginning of a something worse? Below is an update look at a trade in XLF. Our “U.S. Market Trading Map” painted XLF bars in red (sell) – see area ‘A’ in the chart. The first dominant feature on the chart is the rising trend line starting in early 2016. The second dominant feature of the chart is the downward trend since early 2018. Over the past few weeks, the ETF has been basing sideways using the 1-year moving average as support after briefly fell below that level in late June. This is a bearish development, indicating a lack of commitment among the bulls. Over the next few weeks, traders should monitor the retreat and rebound behaviors near the blue line, currently at 27.70. A close below that level on a weekly basis could trigger a new down leg with downside target around 26, based on the 2-year moving average. 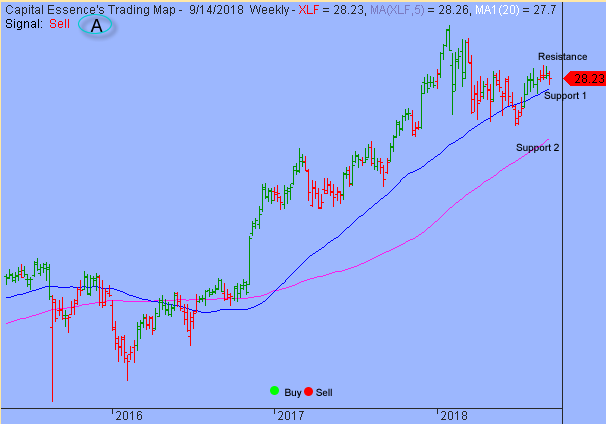 XLF has resistance just below 29. Short-term traders could use that level as the logical level to measure risk against. Short-term technical outlook remains bullish. Last changed September 11, 2018 from slightly bearish (see area ‘A’ in the chart). S&P basing sideways using the 2900 level as support after climbed above that level on Thursday. Money Flow measure trended higher from above the zero line, indicating an increase in buying pressure. Momentum has been strengthened but the return of overbought conditions on an intraday basis suggesting that this is not a time to be long. For now, 2900 is the line in the sand. A close below that level has measured move to 2883, based on lower boundary of the pink band. Short-term trading range: 2883 to 2922. S&P has support near 2900. A close below that level will trigger a short-term sell signal with downside target near 2883, based on the lower boundary of the pink band. That level was tested several times over the past months. Some aggressive traders might use this level like a magnet to buy. The index has resistance near 2922, or the lower boundary of the red band. In summary, the fact that the S&P is short-term overbought as it tests key sentiment level suggested that upside gains could be limited. As for strategy, we’d look to trim positions into short-term overbought strength.